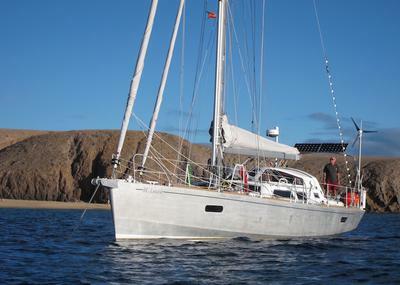 Our beautiful 2013 Boreal 44, RC Louise, is for sale. Due to health issues and the call of our grandchildren, my wife and I are retiring from sailing. Being on the ocean from age 6 to 65 is enough for me! 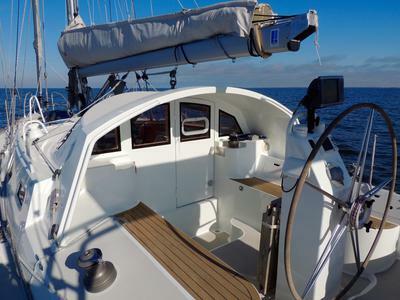 The Boreal is the ultimate French aluminum centerboard expedition sailboat. If you can’t wait for the time it now takes for a new Boreal to be built, we have one for you. As far as we know, it is the only one on the market at this time. RC Louise is fast, sea kindly and strong, a proven ocean crossing machine. She is made to go to high latitudes or exotic tropical Islands where her one meter draft with the centerboard up makes her perfect to get into places few boats can go. Many Boreals have sailed to Antartica and South Georgia Island; we were on our way to the remote Caroline Islands and the jungle rivers of Borneo before plans changed. Boreal won the 2015 European blue water boat of the year, beating out Allures and Jimmy Cornell’s Garcia expedition boat. In comparison, the Boreal has an all aluminum deck/cabin/doghouse and has a protected single rudder and prop instead of two exposed twin rudders and exposed prop. The Boreal has a watertight doghouse with 360 view, and a wide keel box with 10,000 lbs of encapsulated lead which enhances stability. The interior is European ash, which makes it light and airy. The layout includes a double forward cabin berth with head, one quarter berth with two singles, one quarter berth with a double, and a second head aft of the galley. 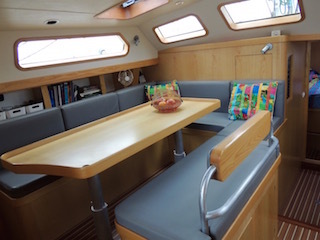 The salon is raised with a welcoming table, which also drops down to a huge berth. There are good handholds and capacious storage through out. The three inches of insulation and the central Refleks diesel heating stove plus radiators in each sleeping cabin makes a Boreal warm and comfortable at high latitudes. The three inches of insulation keeps the boat cool below decks in the afternoon tropical sun. 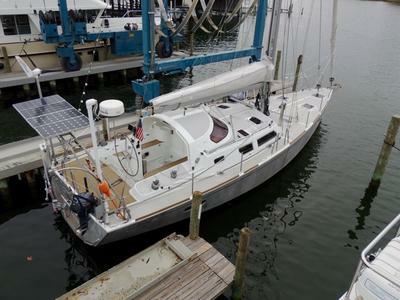 The rig is a cutter with a full batten Elvstrom Hydranet main, genoa, and self-tacking staysail, as well as a gennaker. We think one key to sailing performance is the two stern dagger boards. Drop the lee dagger board going to weather, beam reach or a broad reach and you feel like you are on a railroad track, straight and true. Whether you are using the NKE autopilot or the WindPilot self steering, RC Louise’s helm hardly moves. The centerboard can be adjusted up or down from the helm by hydraulic RAM and from the mast manually using a winch. Just a few other things we love about the Boreal 44... The watertight stern lazarette is huge. This keeps not only the deck clean and safe, but allows immediate full access to the quadrant. On ocean passages we put the inflatable down below along with the 8 HP outboard on a dedicated bracket. The forward lazarette with its ice breaking bow is also watertight and large. The rectangular windlass and chain locker is just in front of the mast and keeps 100 meters of chain weight in the center of the boat. The engine room has amazing access to sit and work from under the companionway steps, which raise easily on a hinge, and also from a door in the port aft cabin. It is the most sea kindly boat we have ever owned; Tracy always got the three day sea sickness on our Mason 44 and never read at sea, but on the Boreal she does not get sick and reads for hours mid-ocean. Recent maintenance has been extensive, including new safety lines, rigging inspection and tune, bottom paint. 3. http://svsila.blogspot.com.es/, 3. Arctic Boreal Expedition on YouTube, and 4. Matt Chauvel on YouTube. If you would like full specifications and inventory list as well as more photos, or want to talk about the boat, please email me at stevewrye@gmail.com or call 541-806-3998 (USA). Statistics: LOA 13.8 m, Beam 4.3 m, Draft 1.02m/2.48m. All our gear is included: life raft, iridium sat phone, copious spares, dinghy, and much more. The price we are asking is $549,000 USD. She is on the hard in Annapolis, MD, US. Thanks for the nice word guys. She is really by far the best blue water boat we have owned in the last 45 years. If you are interested in her please contact. If you're looking for a rather special 44 foot go-anywhere cruising boat, this one may well tick all the boxes.